Great Scott, that's beautiful! Harbingerdawn was right, you never know what you can do until your done with it. Here is NGC 5128 from Earth in SpaceEngine. Can someone help me orient the galaxy to earth in the correct pattern? There's a bug on orienting galaxies : values you give in the catalog are not repected in SE. You can put values in the catalog to get proper orientation, but it's hard to figure out what those values should be since there's no easy way to test it. So I'm waiting this bug to be fixed before finding the proper orientation of galaxies. New model, a nebula : Rho Ophiuchus Cloud Complex ! What galaxy is it ? 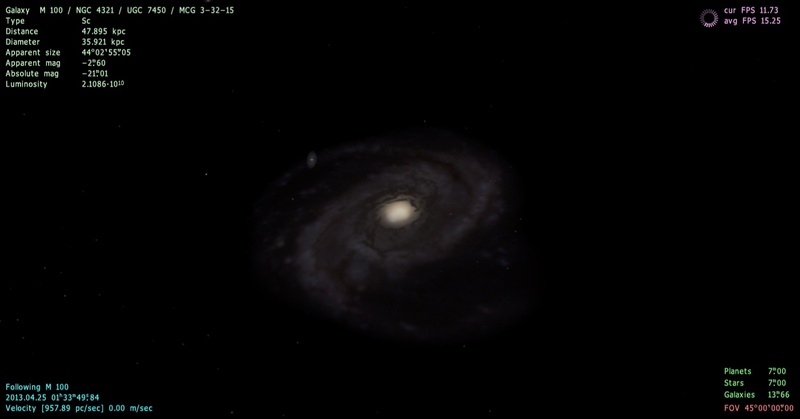 M 100 is already included in 0.97 (the model was made by brainstorm here and SpaceEngineer makes it an official galaxy). Added Mice Galaxies and Blackeye Galaxy. Do I need to sign up to FileDropper to download the texture files? No, just click on the grey rectangle "download this file".